Back cover blurb: You do the same thing every day. You know exactly where you're going. You're not alone. When Zoe Walker sees her photo in the classifieds section of a London newspaper, she is determined to find out why it's there. There's no explanation: just a grainy image, a website address and a phone number. She takes it home to her family, who are convinced it's just someone who looks like Zoe. But the next day the advert shows a photo of a different woman, and another the day after that. Is it a mistake? A coincidence? Or is someone keeping track of every move they make . . . 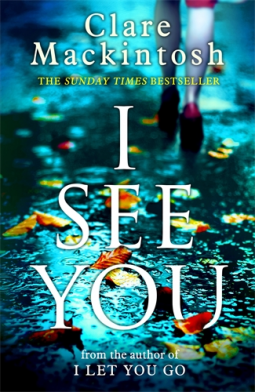 I See You is an edge-of-your-seat, page-turning psychological thriller from the author of I Let You Go - one of the most exciting and successful British debut talents of 2015. I See You is another triumph of a novel by Clare Mackintosh. After such a fantastic debut with I Let You Go, this author had a lot to live up to with her second novel, but I See You has crowned Clare Mackintosh as queen of the psychological thriller. Zoe Walker is happy with her life, she lives with two teenage children and her partner in a nice area. She has a decent job, a wonderful entrepreneurial best friend, and a friendly (the rare kid) ex-husband. When she sees her photo in the classified section of the local newspaper one day on her way home from work, she becomes fearful. Is somebody following her? Stalking her? She keeps a watchful eye over the next few days but nothing else appears. So she trusts her friends and family as they tell her that it is a coincidence, someone that looks very much like her, everyone has a doppelganger right? Without saying too much more, I found this novel almost impossible to put down. Right until its final pages I was certain that I knew which direction the story was taking, only to be proved wrong again and again. And well, what an ending...! Just incredible. I finished I See You on the very same evening that I Let You Go was crowned Theakston Old Peculiar Crime novel of the year 2016. I really wouldn't be surprised if I See You shares the same fate in 2017. I See You is must read novel for 2016. And if you haven't already ready I Let You Go, then please do, as soon as possible, because it's amazing too. I See You is available now via Amazon online and all good book shops.